Culross is Scotland’s most complete example of a burgh of the 17th and 18th centuries. White-harled houses with red-tiled roofs line the steep cobbled streets which run from the market cross to the hilltop abbey. In the centre is the ochre-coloured palace with its beautifully reconstructed period garden, complete with herbs, fruit and vegetables, and rare Scots Dumpy hens. Get a sense of what it would have been like to live in Culross Palace in its prime, with original painted woodwork and beautifully restored 17th- and 18th-century interiors. 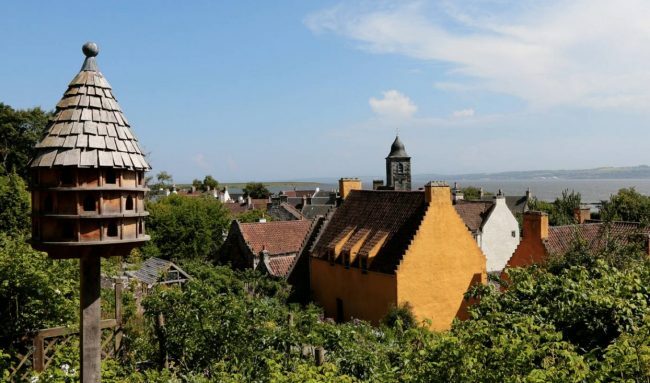 It’s little wonder that Culross is acknowledged as one of the most picturesque villages in Scotland – or that it’s so often used as a film and television location.